A glance at BoC: The Bank of Canada is the major market risk event over the coming week with a fairly light data release calendar on tap. While Canadian central bank is scheduled on January 09th, for BoC to be repriced by a hike as a partial catch up to the Fed’s level and pace, and for some momentary positive risk premium assisted by a covering of shorts. 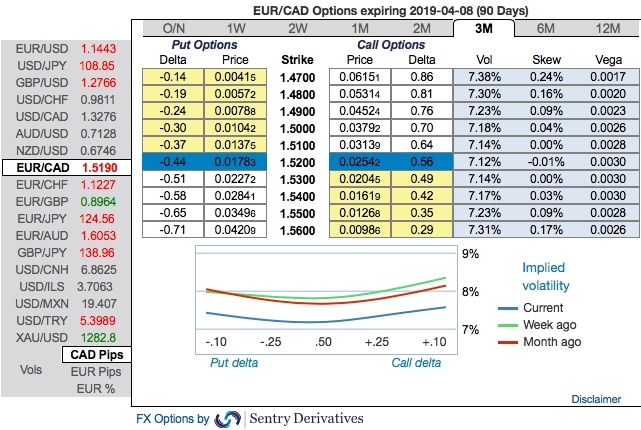 EURCAD OTC outlook: Despite the BoC event, the implied volatilities of this pair have been on the lower side, ranging between 7.31% - 7.38% in 3m tenors. Please be noted that the IV skews of this tenor have been balanced on either side. The prevailing bullish sentiment of the underlying movement with lower IVs is interpreted as conducive environment for writing overpriced OTM puts. Using three-leg strategy would be a smart move to reduce hedging cost. The Rationale: Even though loonie gains of-late, but remains weak in the OTC markets, testing fresh lows into holidays, CAD fundamentally vulnerable as oil prices hit fresh lows; liquidity deteriorating. Both CAD and EUR are softer. But the market tone is troublesome as we note that the continued decline in crude oil with WTI testing fresh lows and threatening $45/bbl makes CAD feebler than EUR. Despite the legislative hurdles remaining after NAFTA transforming to successful USMCA (and thus precluding a true best-case scenario for now), all of the above factors appear to be shifting in a direction that supports CAD strength over the coming months. On the flips side, a probable improvement in rate spreads in the euro’s favour as the ECB delivers rather more tightening than the curve prices. We continue to believe that delivery of early stage ECB tightening should be more impactful for FX. EURCAD has dipped from 1.5640 to the current 1.5202 level of-late, but spiked from the lows of 1.4754 to the current 1.5518 levels in the last couple of months. Further material upside risks from the current levels will likely only come on a gradual basis given the BoC’s dovish rhetoric sees in upcoming monetary policy. Currency Strength Index: FxWirePro's hourly EUR spot index is flashing at -16 (which is mildly bearish), while hourly CAD spot index was at 113 (bullish) at 07:37 GMT.